How does Microsoft's latest tablet stack up? At Microsoft's October 2 event, the company unveiled its highly-anticipated Surface Pro 6 – a powerful Windows 10-powered tablet that can also be used as a laptop. Microsoft's line of Surface Pro tablets have been lauded over the years thanks to their fantastic build quality and elegant designs, and it looks like the Surface Pro 6 continues that tradition. But, with its predecessor, the Surface Pro, having launched last year, how much of an upgrade is the Surface Pro 6? Should you stick to the more affordable device from last year? Let's find out. Last year's Surface Pro stuck pretty close to the design of its predecessor, the Surface Pro 4, featuring a 12.3-inch PixelSense touchscreen with a 2,736 x 1,824-pixel resolution, measuring 0.33 inches (8.4mm) thick, and weighing 1.73 pounds (786g). The Surface Pro 6 doesn't stray too far from the formula either, with similar looks and dimensions, but with upgraded hardware. Some people will welcome this 'if it's ain't broke, don't fix it' approach, but others might find the design feeling a little stagnant. While on the outside it doesn't appear like a great deal has changed between the Surface Pro 2017 and the Surface Pro 6, when it comes to hardware, the Surface Pro 6 offers an impressive upgrade over what came before. Last year's Surface Pro comes with a Core i7-7660U CPU, Intel Iris Plus Graphics 640, 16GB of LPDDR3 RAM and a 1TB solid state drive for storage. This is for the top-of-the-range configuration. The cheapest Surface Pro offers a weaker Intel Core m3 processor, 128GB SSD and 4GB of RAM. Meanwhile, the Surface Pro 6 has the latest 8th generation Intel Quad Core processors (either i5 or i7), which according to Microsoft offers 67% better performance than the chip in the Surface Pro. Both versions come with Intel UHD Graphics 620 integrated graphics cards, a choice of 8GB or 16GB RAM, up to 1TB storage, and a 12.3 PixelSense display with a 2,736 x 1,824 resolution. The Surface Pro launched with a $799 price in the US or £799 in the UK (around AU$1,380) for the entry-level model. Meanwhile the top-end version costs $2,699 (£2,699, AU$3,999) for an Intel Core i7 CPU paired with a 1TB SSD and 16GB of RAM. In the run-up to the Surface Pro 6's unveiling, rumors were swirling that Microsoft would pitch its new device at the same price. While the Surface Pro 6 doesn't quite hit the same price point, it starts at a similar $899/£879/AU$1,349. 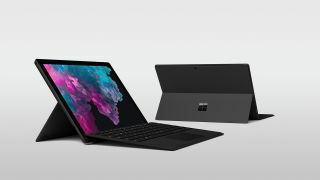 There's also a range of configurations for the Surface Pro 6, and depending on the hardware that you choose, the price changes accordingly. For example, a Surface Pro 6 with 16GB of RAM, an Intel Core i7 processor and 512GB storage will cost $1,899 (£1,799, AU$2,879). Considering the performance boost, the price of the Surface Pro 6 compared to its predecessor is incredibly competitive, making the new Surface Pro 6 a no-brainer when it comes to price. Surface Pro 6 vs Surface Pro 2017: should I upgrade? So, is the Surface Pro 6 a worthy upgrade over the Surface Pro 2017? If you already own a Surface Pro, then the Surface Pro 6 offers a decent enough performance boost to justify making the upgrade. Of course, if you're happy enough with the Surface Pro 2017, then you'll feel no rush to ditch it for the newer model. If you don't have a Surface Pro and are thinking about getting one of Microsoft's tablets, then we can heartily recommend going for the Surface Pro 6 over its predecessor. It offers the same brilliant design, while also containing some excellent spec upgrades. Best of all, it's around the same price as the Surface Pro 2017. Of course, if you're looking for a bargain, you may find the Surface Pro 2017 dropping in price now that the Surface Pro 6 is available to buy. Keep a keen eye on Black Friday, as we may see some price cuts then.